Thiruvathirakali is a popular group dance in Kerala which is performed by the women. It is performed on the Thiruvathira day of the month Dhanu. The performers circle around a Vilakku and follow a circular movement while dancing. They clap their hands and sing the Thiruvathira pattu while dancing. The leader in the group sing the first line of the song and the rest of the members repeat it as a chorus. Thiruvathirakali is also called as Kaikottikali. 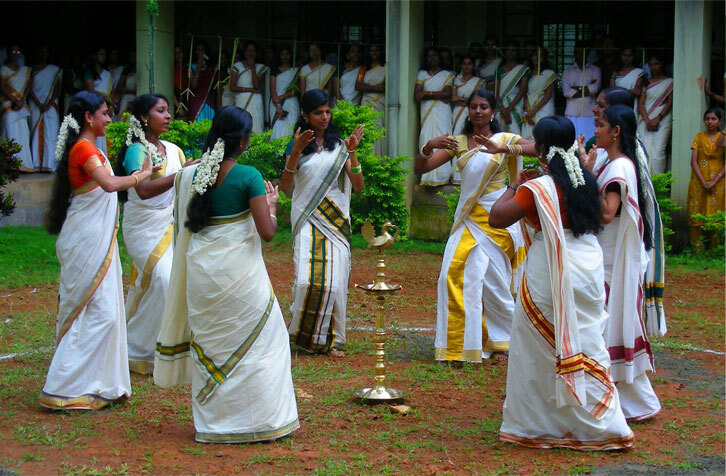 The dance has become popular for all seasons especially during the festival Onam. For Onam the dancers circle around the floral carpet. This dance is also performed in stage as well as in competitions. The women perform this dance mainly to attain marital gladness. It is the women who organizes these dances and is performed to celebrate the marital duties and the female energy. Women of all ages perform this dance. It was believed that it was this dance that bought the God of Love named as Kamadeva back to life after he was burnt to ashes by Lord Shiva. On the day of performance, the women stay awake at night as they believe that Lord Shiva arrives on that day. The women wear typical Kerala sari which is a white sari bordered with golden color. It may be either two piece cloth called mundu and neriyathu or as sari. Mundu is the dress that is worn around the waist and the Neriyathu is worn over the blouse. They neatly tie their hair and decorate it with jasmine flowers. The group consists of around 8 to 10 dancers and it requires great co ordination to dance properly. They move in a circular manner both in the clockwise as well as anti clockwise direction. They make both fast and slow movements in a graceful manner. It is believed that this dance form has originated from Kathakali such as the Ragachaya of Kaikottikali. In this dance, importance is given to the body movements rather than gestures. The songs sung may be either based on mythology or from folk tales. At times devotional songs are also sung. For the Thiruvathirakali performed during Onam, the song sung is mainly about the King Mahabali.